Nearly all new visitors wanting to stay within the ashram (as Sai Baba highly advised this for its spiritual benefits!) - if all small apartments were full up - were assigned to the so-called 'sheds' (a word that was banned by the ashram authorities because it sounded primitive - instead the word 'hall' was to be used!). However, the title was most fitting as the accommodation consisted in very large hangar-like sheds without any furniture whatever and only concrete floors. One had to provide whatever one could to sleep on during one's stay. Many have written about this and the intense problems of living in them for most visitors. Visitors much preferred 1 or 2-room apartments which (though still primitive) originally cost a couple of rupees a day, though there was no guarantee that one could stay for the allocated period due to sudden arrival of the so-called 'owners', who had paid a large sum for the privilege of having the same rooms (and a small lovk-up kitchen). Due to the imperious nature of most of the staff of the accommodation office, especially towards foreigners, one could not plan ahead as no guarantees were given and one could be told to leave the ashram as soon as one's allocation expired. One could also suddenly find that 2 or 3 other visitors had also been allocated to stay there with you. In the sheds one could find one's belongings had been ravaged by a troop of maurading monkeys, which could mostly enter at will, or by mangy pi-dogs which would sneak in to search for food at any moment. Another constant problem was the dust, swept up by ancient bent Indian women into clouds all over the place, carrying germs to all and sundry. Few visitors would escape one for or another cough, cold, chest or lung infection, especially when there were large crowds, such as at the birthday celebrations and major festivals. The staff at Sai ashrams usually offered a modicum of neutral, fact-based guidance to visitors which, if followed to the letter, would go some way in protecting them from unfortunate experiences while staying there. They warned that one should look carefully after one's personal property at all times, for thieves cannot be kept out of the ashram. 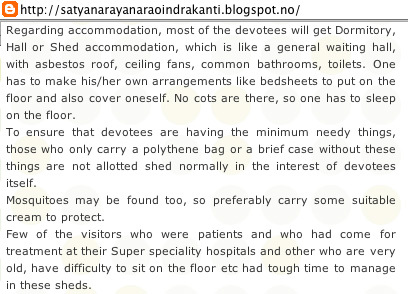 They also repeated Sathya Sai Baba's advice not go outside to Puttaparti village to shop or socialise. Had they told the details of some previous incidents, visitors would surely take this advice much more seriously than they mostly do. The number of disappearances and murders of foreign devotees both in the village and inside the ashram are known to few, but had the not been buried assiduously, they would surely cause major doubts about the supposed 'divine protection' Sai Baba guarantees his devotees. However, the offices were most often staffed mostly by men of low calibre, often by Indian chauvinists who put any foreigners to whom they harboured a dislike through various unnecessary hoops. Visitors had to watch their step carefully as there were plenty of scorpions and snakes, both literal and figurative. All devotees soon got used to the kind of 'double-accounting' whereby two versions of the facts exist, one close to reality for insiders who cannot avoid knowing something - and another that defies and cloaks the actual facts. The ashram authorities hid all potentially negative information, or - when it began to leak out - hushed it up by any means available. Not infrequently the only solution they find is to send away all visitors from the ashram on very short notice. 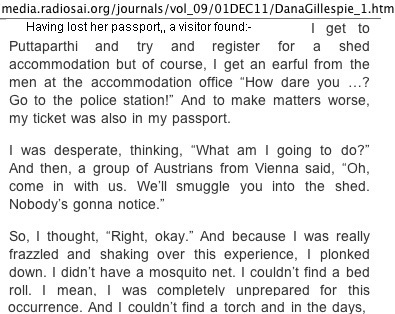 They always took foreign passports from visitors (on the pretext that the local police required to see them, which seemed completely bogus). The public relations operation was ostensibly to provide information to visitors about the ashram, its ruotines and requirements and so forth. 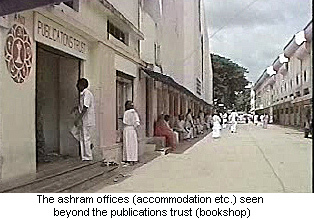 In fact it also functioned as a information-gathering service from the ashram officials and Sathya Sai Baba. One had to fill out extensive forms with personal information, all of which would no doubt help Sathya Sai Baba to decide to whom it was worth giving interviews (primarily those with good positions and evident financial resources - who were often those selected for interviews on occasions where a list of invited interviewees was issued some time before the event. (I was on such a list, being a university teacher). Sai Baba could learn in advance many details about those who were in any national group (and the head of the ashram and others would speak to him regularly each morning before darsan). This enabled him to appear to know things that would seem 'omniscient' to the trusting aspirant. (In additions, of course, he collected countless private letters in the darshan lines from followers which must have informed him of otherwise unknowable facts about the writers, who were identifiable through their names (and if need be most likely cross-checked with the public relations office files).